Prison Service considering force-feeding prisoners engaged in hunger strike over jamming of smuggled cell phones. Hamas terrorists imprisoned in Israel began a hunger strike Monday evening in protest against restrictions on their uses of cell phones. 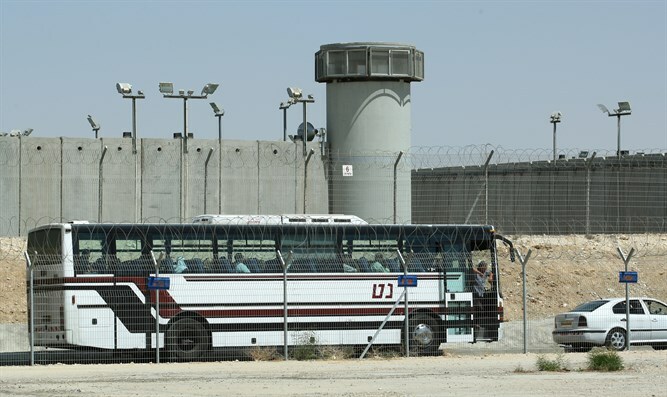 The hunger strike was launched after negotiations with the Israel Prison Service (IPS) failed. The IPS warned in advance that the strike would be met with harsh measures and even noted that they would consider forced feeding the prisoners and denying them access to attorneys. The terrorists are demand the removal of cellular jamming jacks installed in the cells, the cancellation of recent punitive measures, the restoration of family visits, and the improvement of the conditions of their imprisonment. The jamming devices prevent the terrorists from using cell phones smuggled to them in prison. Clashes between Hamas terrorists imprisoned in Israel and prison guards have occurred in recent weekss. In one incident, the terrorists set fire to cells and even attacked prison guards at Ketziot Prison, moderately injuring one guard.